Review: Action! Adventure! And….Wait! What are slaughterbirds? Museum of Thieves, by Lian Tanner, is book 1 in the Keepers trilogy. It is 312 pages of pure adventure! The main character is Goldie Roth; she's a girl with golden hair. She lives in the city of Jewel, during the late middle ages. In the beginning, Goldie is in the punishment chains. The punishment chains are chains that children wear to cuff their hands when they get in trouble. It's just the rule in Jewel. She really hates them along with Guardian Hope, one of the seven Guardians. The seven Guardians are like seven gods. The seven Guardians call her impatient and dangerous (though she's not). All she wants is to be separated from her parents on separation day. But it's canceled for a mysterious reason. But then, Goldie finds the perfect plot. On her chance, she bolts out the door. Goldie then realizes that was a bad idea. Now she's alone, and to make things worse, her parents are in jail because of her. Can Goldie stop this crisis and save her parents? Museum of Thieves is a great adventure. The ending will keep you asking for more! If you love the action-adventure genre, this book is for you. Museum of Thieves is for ages 10 through adult. If you really love the book (which you probably will), look for the second book: City of Lies. 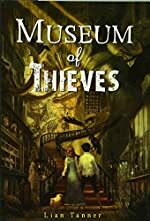 I rate Museum of Thieves 5 out of 5 stars. The reason being it's the kind of action you never thought would have happend. I hope to see City of Lies soon! We would like to thank Random House for providing a copy of Museum of Thieves for this review. Have you read Museum of Thieves? How would you rate it?